I wish I had video of tonight. At the end, I said, "He hasn't gone this well in..." and as I said "at least six months" my trainer said, "ever". She followed that up with a text later that night complimenting the ride again, which she never does. It was awesome! Having lessons in a row, especially the same week as a major biomechanics...philosophy? shift, has been astoundingly productive for me, and that translates to Connor. Many of these things, I have heard before. And he has gone this well before. But I forgot them, because I ride on my own a lot and I'm far from the most proprioceptive person out there. And then I wonder why my horse can't Dressage anymore, when I'm the cause. Please accept these photos of my horse being MASSIVELY CUTE as apologies for not having relevant pictures of anything right now. That whole bracing in the right stirrup all the time thing? It's causing a lot of problems. And it's the hardest position fault I've ever had to correct, because it's just not as easily felt or as visible as hand things, or shoulder things. I need constant reminders from my trainer right now, though hopefully not for long. When I am braced, Connor can't feel my seat. If he can't feel my seat, he can't "hear" my core. If he can't hear my core, he rushes and falls all over the place. 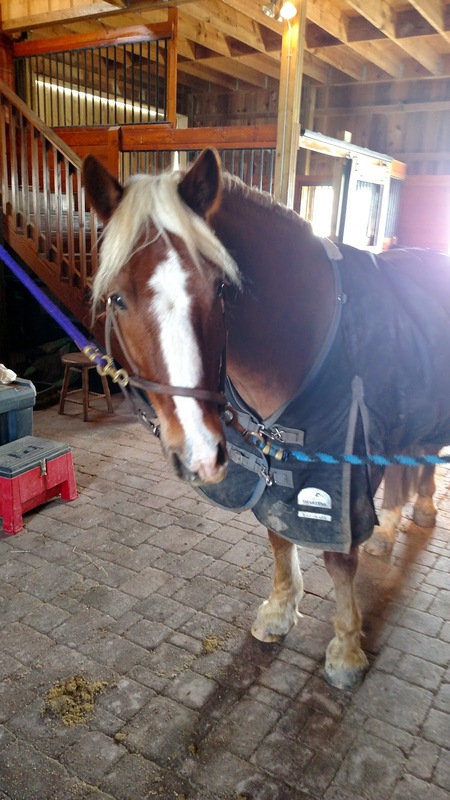 As soon as I relax my right leg and sink into the saddle, he goes at the tempo I set with my core. The painstakingly slow walk (although we mostly did trot tonight) also gives my already very perceptive trainer a chance to see things she might not immediately see otherwise. Her point to sit more on my left seatbone when we were on the right rein and he was tossing me over to the right made a gigantic difference in the way he went. Just...I mean...how could you not give him treats every time you see him? I have one more lesson tomorrow, but the last two days have made me realize that, at least until all of this position stuff is internalized, I need more lessons, or, more accurately, fewer rides on my own. For at least the rest of this month, I'm going to take two per week. I need eyes on the ground that will save me from myself until sitting quietly and evenly is my new M.O., because I am not going to forget all of this again and go through this cycle again. He felt AMAZING tonight. I realize that means nothing without video, but...for example, he was so on my aids he ignored the bucking horse in the field next to us on our first ride in the outdoor (!) since October. He was pliable, listening and so very reactive to the slightest of aids. I want that all the time! 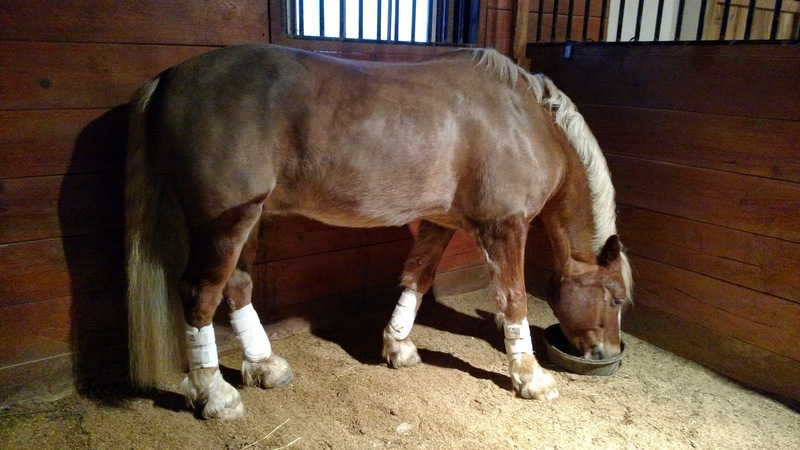 Tail washed, mane pulled, and eating dinner with his boots on. My little sporthorse. It's SO much fun to feel it all come together, especially on a horse you've been bringing along largely yourself. I can't wait until Mo is ready for this stuff (but first we have to survive the canter). It's surprising how addictive it is. 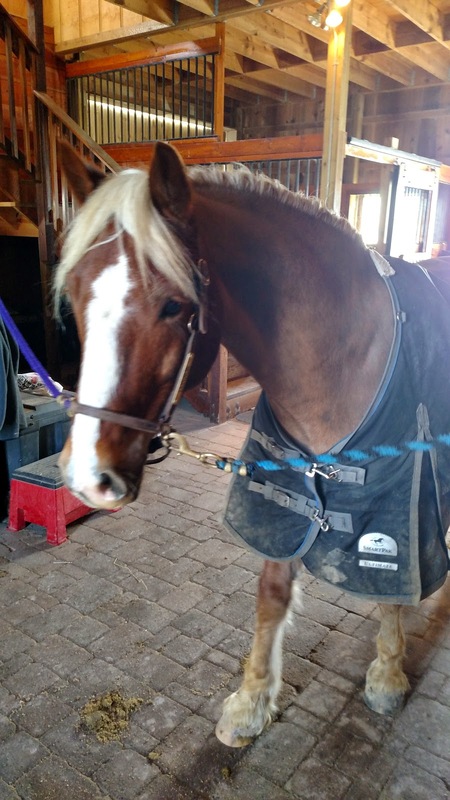 Mary noticed that I sit crooked in jumping tack--any saddle, my old one, my new one, hers--but not in dressage tack. It's weird. I think it might be because the only horse I ever ride in dressage tack is also by far the most likely to kill me, so I'm wayyyyy more careful. :) And you're right, hard to fix problems you can't see that have come to feel normal. It really is fun. I can see it being easier to sit crooked in jump tack. Not only do you have shorter stirrups/an easier time bracing, but typically, we do a lot less finite checking for straightness in jump lessons than we do in Dressage, even if the beginning of the lesson focuses on suppling and straightness. So very, very exciting! And I love the last picture of your little sporthorse... Connor is maturing into such an awesome athlete! Two lessons a week? The luxury! I dream of that day. :-) Sound like a fantastic plan. Haha, well, I was in a real live tack store with my tax return in my bank account on Tuesday and was completely crippled to spend any money, even when my husband told me to, so I'm just telling myself I'm buying lessons instead! That works, right? It makes a big difference - even just to have someone calling you out on the ground. Good luck! Happy he's going so well! From reading your posts, it makes me wish I could take a lesson with your trainer. If/when you ever come up for Rolex, we can make that happen! She typically doesn't do one-off lessons for locals, but has always made exception for my riding friends! Ah I love the sound of this! I'm so excited for you two!